And something else in the scripts specific to Pokémon Super Mystery Dungoen that can't be mentioned without revealing spoilers. It is the last item in a similar list in this video if you're fine with being spoiled, or if you've seen it before. You must have Java on your computer to use this. 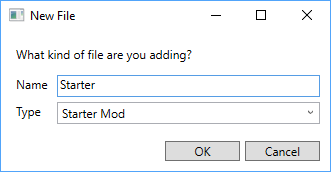 On the New Project window, choose "Starter Mod" in the drop-down, and fill in the name with something that makes sense. Then click OK. Wait until the loading is complete. This is one of the heavier mods, and may take some time even on beefier computers. Save the solution, to avoid having to repeat step 2 if something goes wrong. Expand the project you just created and open "fixed_pokemon.bin". You can do this either by double-clicking or by right-clicking and clicking Open. Each Pokémon must have 4 moves. It's been a while since I tried having less, but I remember things not working with fewer than 4 moves. 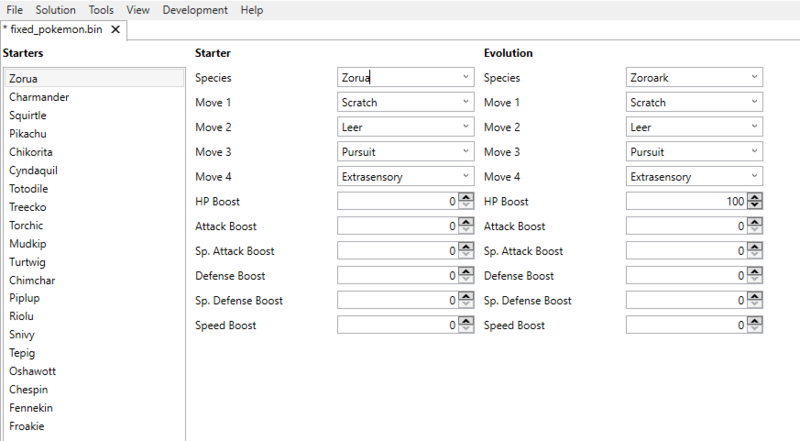 In my example, I got the first three moves from the level up, and the fourth from Zorua's set of egg moves, although you are not required to stick to these; you can pick anything you want. (PSMD only) The evolution must be the final evolution in the line. If you pick a Pokémon with multiple evolutions, the first on will be used. Refer to the PSMD Pokédex index to find which evolution comes first (for example, if the starter is Eevee, the first evolution is Vaporeon). 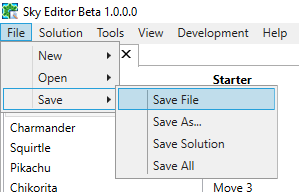 Click File -> Save -> Save File. You can now rebuild the mod-pack. Note that this may take a while. 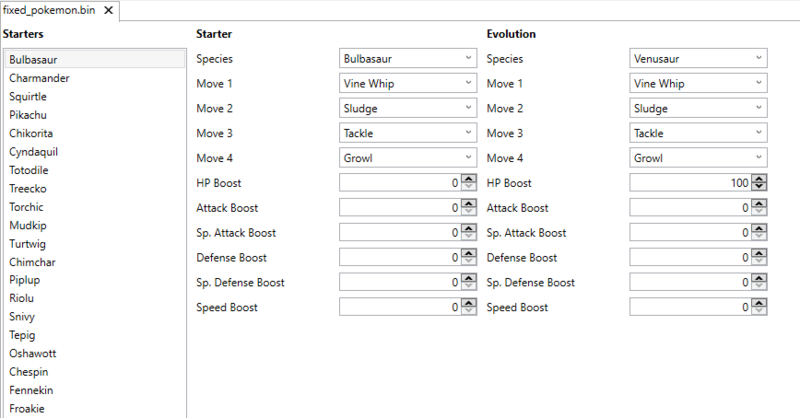 Only the first evolution in the index of a branched line will work, but for fully evolved pokemon with alternate forms, like sawsbuck, vivillon or meowstic, can you choose any of them or are you still restricted to the first one in the index? Hello, I have a few questions regarding the starter mod. In the tutorial, it stated that I could use any .3ds file as the rom source for applying modpacks. Does this mean I can use any decrypted rom I got off the internet as the source, and not specifically the one saved to my 3ds SD? I'm also unsure on how to apply the edited ROM to my digital copy. I don't have Luma, and currently only have homebrew launcher through the steeldivers exploit. Any help would be greatly appreciated, thank you! Technically yes, but we don't condone piracy on this site. Please try to dump your game yourself. If GodMode9 isn't an option, try braindump. Ok, I'll give braindump a try and look into HANS. Thank you for the quick response and help! I'm not entirely sure if I did something wrong but if I have "Portrait Patching" enabled my game crashes every time a portrait is loaded on screen. The issue goes away when I disable it but the portrait boxes don't show the pokemon. Any advice on what I can do to fix this? This is for PSMD and I am only using the Starter Mod. Even if I don't change the player/partner, I still get the crash upon a portrait being loaded. It works now! Thanks a bunch. 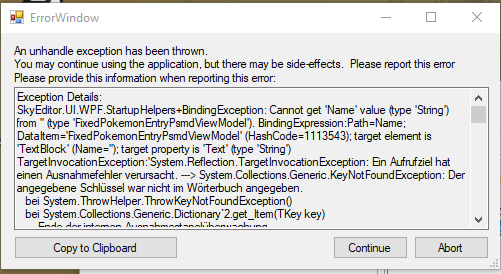 hello, I'm new to this, and I just want to play with eevee in pokemon super mistery dungeon, I followed these tutorials but I have not had any luck, since it gets blocked when I start the game and I do not know what I did wrong, can someone pass me some patch for private?